The Channel Tunnel 'Le Shuttle' operates from the Cheriton terminal at Folkestone on the M20 about an hour from the M25 junction. There are frequent trains every hour throughout the day up to about 11 pm, depending on the time of year. 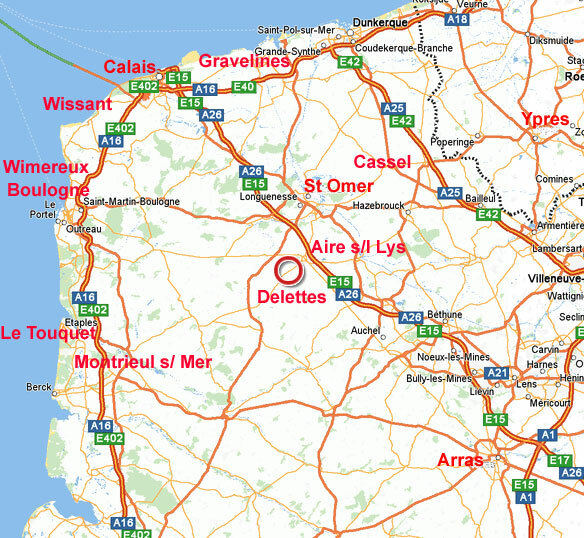 Journey time on Le Shuttle is 35 minutes with an easy journey of about 45 minutes to The Farmhouse from the French terminal at Sangatte in Pas de Calais mostly on the autoroute A26 to exit 4. Most of the ferry companies operate from Dover to Calais and can be accessed from the end of the M20 - about 15 minutes beyond Le Shuttle terminal. All the crossings often have special fares for short break/excursions. Journey times from London can vary according to the time of day but as a guide, using the Channel Tunnel, we reckon it takes around 3.5 hours door to door from Central London. The great thing about The Farmhouse is that in 45 minutes from your Channel crossing you can be enjoying yourself in rural France, without hours of motorway driving and expensive auto route costs and overnight stays en-route. The Farmhouse is within easy reach of miles of coastline which curves around where it is situated.